I hereby professed my love for doilies and crafts (Winston Edit: And me! ), hence it will be displayed profoundly in our wedding. 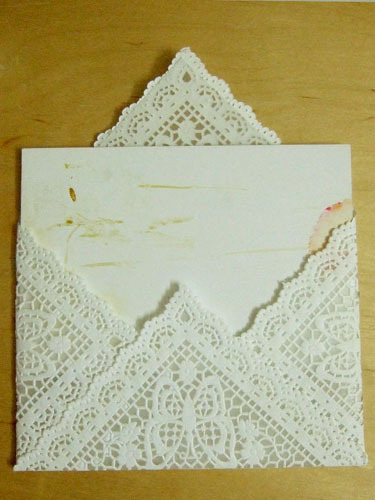 The first item to support that statement is my exquisite doilies envelope, inspired by Martha Stewart’s Wedding. A little update, I am in the midst of expanding my previous company, Diary & Design Wedding into a specialized design & decor for wedding & event, Rosette Designs, while my partner will be focusing more in wedding planning under Wedding Diary. So look for us if you are looking for wedding design & decor! Yup! I am going to make a hundred pieces of this. Ambitious as it may sound, I still have 6 months in the making and my wonderful artist/designer friends to my aid. So, to all our beloved guests, this is just for you! 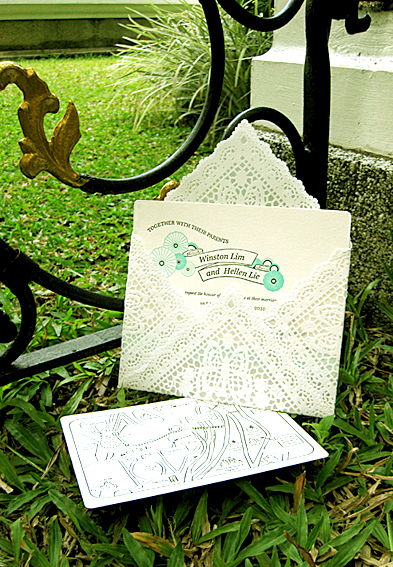 My own wedding Invitation, dream come true : Lace envelope and letterpress invitation. I love this idea, it looks beautiful and elegant. Could you tell me where to purchase doilies like the ones you used? I have been looking online but I can’t find those or even doilies in that size. Thank you for the compliment! Glad you like it. I bought the square doilies from eBay.com. The seller based in US, this is the same doilies from Martha Stewart Spring 2009 issue. Look for PAPER SQUARE DOILIES BUTTERFLIES 9 x 9 SHOWERS WEDDINGS. All the best in finding it! I just searched ebay and am not able to find the doilies based on your description above. Did you order the doilies recently? I bought it few months ago. I have checked in ebay, the seller has ended the listing. You can still find square doillies with other pattern. Hi, I was wondering what sized invitations you used to fit inside the envelope. I just started an invitation company, so I can experiment on mine! I’m using the same doilies as yours & i came across your website. May i know the exact size of your invatation card ? My invitation size is 5 x 7 inch. My pleasure to share! Thank you Ellen for your prompt reply. Thanks once again, i shall print my invitation for exactly the size of 5 x 7 inch. Oh wow, these are really, really stunning! I would love to link to this in my next Wedding Roundup if you didn’t mind. Hi Rachel, sure! That would be great! I love lace and this idea is just fantastic. I love the way yours turned out. Those are so pretty, great idea! Totally gorgeous! Thanks for the share!! 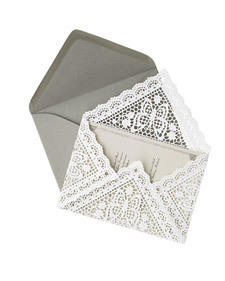 Hi , does anyone know if you can buy these dollie envelopes, i would love to use them for my wedding invites, but dont think Im up to making 100 of them? I think you will need additional envelope if you want to post it! These are stunning! I love the delicate, yet playful feel they have. Would you mind if I feature these on my Wedding Planning blog DeeLovely Day? Thanks for sharing! Hi Dee, I’m flattered! sure, go ahead! Pingback: I’ve been feeding my obsession « Life. Love. Discernment. I absolutely adore these envelopes!! I’ve actually already printed my invites and they are 15x15cm. Do you think there would be a doily big enough to make envelopes for my invites? these are absolutely amazing! I’ve actually already printed my invites, and they are 15x15cm.. Do u think its possible to find a doily big enough for my invite? Maybe not the square ones. alternatively you can print the doilies pattern on transparent paper to get the effect. Hey i find them on the next website, i will order them!! i absolutely love this envelop. I’m off to see if I can find square doilies now! I am new to your blog (having found it through my blog’s analytics). This is a great looking project. Fantastic idea! I love these! I’m throwing my cousin’s bridal shower and would love to use this idea to send out the invites. Are these USPS friendly or would I have to send them in another envelope? Have you tried sending any yet? We did send them via another bigger envelope, as we have other invites with it as well. For other close friends and friends we meet often, we gave the invites to them (which does bring with it a personal touch and sincerity). I am a bit apprehensive that it may not be USPS friendly though. I will suggest not risking it. Thanks for the tutorial! I found your site via pinterest & have featured it as one of my favorite pins this week! Beautiful ideea.Beautiful tutorial. Thank you. I love these, I am a doily freak. Just ask my daughter. I am going to use this idea for valentines and other occasions. Thank you for sharing! Beautiful! Thanks so much for sharing, I’m featuring this tomorrow on a lace round up on my blog. I’d like to go with something much simpler… Do you think I could just fold the doily only, and not use tissue paper or spray adhesive? Wow, I’m in Love with these envelopes!!! 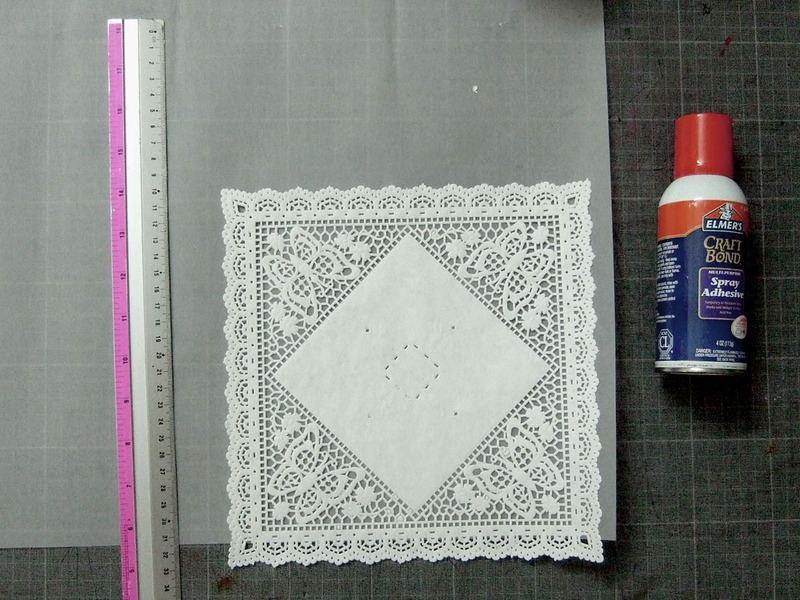 Do you think the 9 inch square doily size will fit a A6 ( 4 1/2″ x 6 1/4″) folded card? Or do you recommend a different size paper doily? Beautiful idea! Found you via Alexia @ Persia Lou. I’m also having a casual outdoor wedding & would love to make these envelopes! I just LOVE this post! !I’m from Brazil but tomorow I’m going to Florida! Can you tell me, How should I need to call this paper, and where can I find it? It’s a square doily, you can find it in the cake shop or find it online! Pingback: Make it…Doily craft. | Grow it, make it, try it! Thanks for such an inspired project! Love this. Im featuring it on my blog for an Affordable DIY wedding using Doilies. Linking back to this awesome tutorial. Thanks. I love this idea and would like to make it the envelope for my wedding invitations but I was wonder how well they held up going through the mail? I just don’t want them all tattered by the time it reaches the guest. How did you address your invitations on the lace? Just by printing labels or did you write directly on it? I am so looking forward to making these myself. So happy you shared this lovely idea. the envelopes look expensive! I want to send these out for my special events. I love this whole idea! Especially for post-wedding thank you notes! All I can find online is 8×8 inch square doilies or 10×10 inch.. do you think a 10×10 inch doily will still fit in a 5×7 A7 envelope? What size was the Doilies that you used for this? I havn’t made my invitations yet so i can make them to the size of the evelope which you said your invitations were 5×7. I love this idea so much and is going to go with my vintage theme and just have these little details make it all the better. I love this idea. When I saw it I thought they were bought at a store until I read the whole project. I work in a daycare so I am always looking for something new and exciting. But this is something too special for daycare. Had I found this before I sent out my parents 25 wedding anniversary invitations I would have done this as my mom loves lacy and unique ways of sending letters, inviations and cards. So simple and so beautiful! Right for my Enjoying Simple DiY Pinterest board! ahhh nice I will be doing this for my envelopes thank you so much for sharing and inspiring!! Gr8 work dear!! Just loved it..
My prison pen friends will love these, so elegant. Thanks for sharing. Hi there. I would like to know if you make these for brides? If so what would the cost be for 100? I just ordered these doilies from http://www.maryjeanonline.com. They cost $19.50 for 60 doilies plus shipping. I love this envelope you have created and was wondering what is the point of the tracing paper? It’s to make the envelope more sturdy! I found a website that sells lace paper doilies for awesome prices. I had just put my order in today. Check it out!! Hi sure! please link back to our blog. Just a quick question. Do the 9″ squares make A5 sized envelopes. I want to do this for my sisters wedding, but we are only able to find 8″ squares. And also is it best to line the inside of the envelope, does that make it easier? is there a basic how to for making an evelope,im even stuck there! !becasue then fingers crossed from your post i could work then to design the doilie etc for the size. thankyou.sorry to be such a picky commentor id love it if i could just follow this hehe. I just ran across this, hope you had a beautiful wedding, I hope to make Valentine Cards using the doily envelope….these are beautiful.